Most crochet patterns include some variation of the instruction "weave in your ends," "weave in your loose ends," or "weave in any remaining ends." It's important for every crochet enthusiast to know how to do this. There are also techniques for avoiding this task or minimizing the amount of loose-end-weaving that needs to be done. Some of them take a little pre-planning. 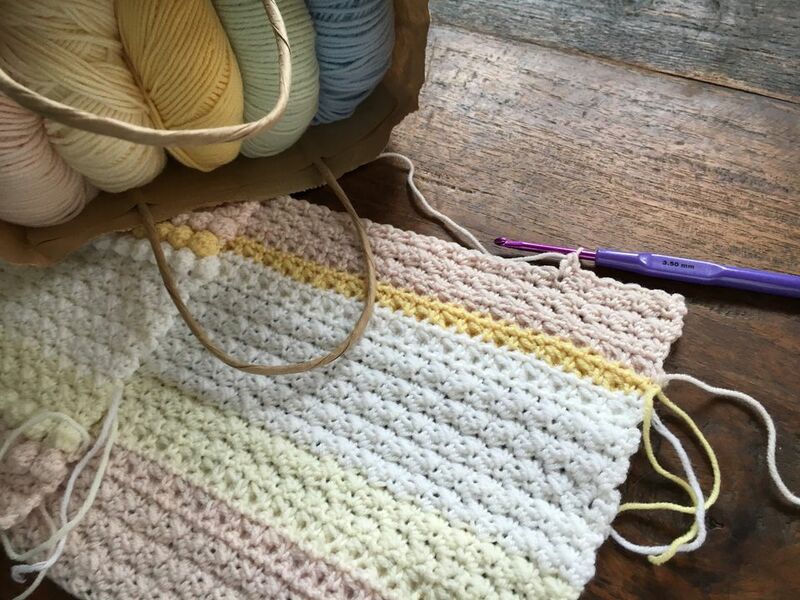 Once you learn how to incorporate them into your crochet process, it speeds up the finishing noticeably on certain projects, particularly ones that have lots of color changes. To accomplish this task, you'll want to have a tapestry needle, a needle threader (optional) and a finished project to work on. There are different ways to weave in ends, but they all begin with threading the loose end through a tapestry needle. On the wrong side of the crochet, run the needle through a couple of stitches horizontally. Then thread it through a stitch vertically. Now thread it back through the stitches horizontally (opposite of the first direction). This technique is not ideal for double-sided items. On the wrong side of the crochet, whipstitch the loose end through several stitches. This is different from the weaving technique in that you are going in the bottom of each stitch and out the top, then in the bottom of the next stitch. As with weaving, you then make a vertical stitch and repeat the whipstitch in the opposite direction. This is not ideal for double-sided items. If you are crocheting with the same color, keep a long tail on the loose end and double up the loose end with your new yarn as you crochet the pattern. Keep in mind that these are only three possible ways of approaching this task. For example, there are people who like separating the yarn plies at the end and weaving those in separately. This is a good technique to use with single crochet stitch, or with stitches that don't have a lot of open areas. The technique doesn't work as well with lacy stitches. This works best if you crochet tightly, and might not be a good technique for you to use if you crochet loosely. Carrying the yarn up the sides of your work can be done with striped crochet patterns. This technique saves you time by eliminating the need for weaving in an excessive amount of ends. Usually, when you use this method, you'll end up with only a few ends at the beginning and end to deal with. 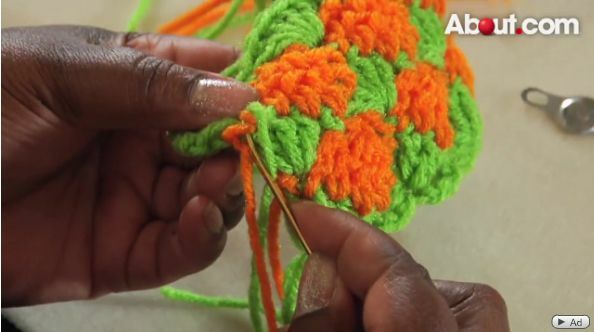 When you crochet granny squares, hexagons or similar motifs, you can use a technique called join as you go. You'll eliminate bunches of loose ends because each motif would ordinarily have had two loose ends, one at the beginning and one at the end. With the join-as-you-go technique, you don't generate these loose ends to start with, so there's no need to weave them in later. With many projects such as scarves, shawls, and afghans, you can transform your loose ends into a fringe that will finish off your project. This technique is particularly effective when used with colorful projects, striped projects, and tapestry crochet projects.